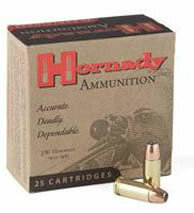 Details: "Hornady's pistol ammo delivers both accurate and dependable knockdown power. Included in the features are select cases that are chosen to meet unusually high standards for reliable feeding, corrosion resistance, proper hardness, and the ability to withstand maximum chamber pressures along with primers that are chosen for their ability to quickly, completely, and reliably ignite the powder charge. Controlled Expansion XTP� bullets are famous for their ability to expand reliably across a wide range of velocities. The XTP bullet was specially built to withstand incredible velocities, and still deliver controlled expansion and weight retention. Special features in the nose facilitate and control expansion on impact."